Our first morning in KL, I receive a text message from my cousin which reads: ‘U want to eat fish head noodles?’ I repeat the question to Christopher and we both visualise a bowl of steaming broth with fish heads bobbing in it. It did not sound appetising although I don’t have a problem with eating fish heads. I particularly like the cheeks which are tender, juicy and succulent. I have a rule about this sort of situations – keep an open-mind and try something new. It is just before 11am when my cousin picks us up from the hotel. She tells us this place gets packed during lunchtime so we are going for an early lunch. My eyes light up when we arrive at a cluster of shops in Taman Danau Desa. There are many large round tables in the ground floor unit and a few have spilled out onto the pavement. It is already packed, a sign of good food. We share a table with another couple. There are no table-menus, just a large board on one wall which simply read: fried fish head noodle soup RM6.50, fish paste noodle soup RM6.50. My cousin recommends a mixture, both fried and paste with bee hoon (rice vermicelli). I can’t help but get a bit overexcited when we stumble upon a dish or a cuisine that I have never tasted before. These unexpected finds usually occur when we have ‘local’ knowledge. Three generous bowls of rice vermicelli in a creamy soup arrive. A scatter of deep-fried shallots and sliced spring onions sprinkled on top. The soup is surprisingly tangy, a little milky from the evaporated milk and a fresh sharpness from the tomatoes and pickled mustard greens. There is no sign of a whole fish head, only chucks of what looks like deep-fried fish and elongated fish balls, with a good coarse texture. No doubt the chucks of crispy fish are from the fish head, although a little bony it has a delicate sweetness. The accompanying small side dish reminds me of the Burmese baked shrimp paste dip (ngapi daung). There is also the usual dish of sliced green chillies and a bottle of soy sauce for extra garnish. I think there is something to be said about noodle soups. It is wholesome and comforting anytime of the day, and equally satisfying on a hot day like today. 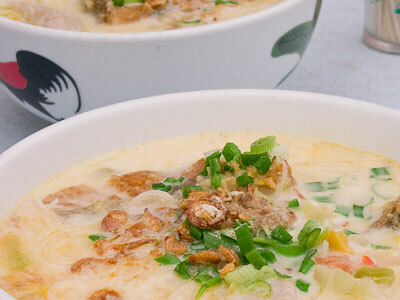 I can never tire of noodle soups and this is one dish that I will add to my list of things to cook when I return home. Here is a Fish head noodle recipe for those who would like to give it a try. Love to hear from you if you have tried the recipe or if you would like to share your own recipe. I recall eating a whole fish head ( nga min fish) floating in a clear soup in Burma. Of course I did not eat the bones! r u going to put something new? Could you please advise how can I play passed cooking video in your site . My mum makes fish head noodles that make me smile. hi Cho, how do you make dahinde poh de ,the one where you flaten the dahinde and put coconut cream on it .